Orlando J. Addison was born in Honduras, where he lived and studied throughout the Central American political upheavals of the 1980s. Addison uses his experiences as inspiration for his writing. Addison received his degree in social science from the Universidad Nacional Autonoma de Honduras. He later came to the United States, and he earned a master’s degree in divinity from the Virginia Theological Seminary. Addison served as an Episcopal priest and vicar of Holy Faith in Port St. Lucie, Florida. Addison writes about the Afro-Honduran experience and Afro-Latino culture. He has previously published two bilingual poetry collections—La Noche Tuvo Miedo and Canto Afrolatino / Afro-Latin Song—and a novel, Happy Land. 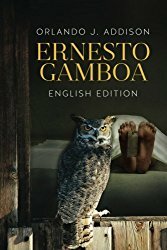 The Spanish-language version of his second novel, Ernesto Gamboa, won the International Latino Book Award. Addison has also written for the Nuevo Herald and other Hispanic newspapers. When books are ordered directly through the commission, a percentage of the proceeds from the sale of Father Addison’s book will be given to support the work of Central Florida’s Honduras Commission. To order, please email Commission Chair, Wesny Dubic at wdubic02@hotmail.com.